Feel safe and secure with this complete plug and play alarm system. With the Somfy Home Alarm Pack, you can protect every nook and cranny in your house and be warned even before the intruder has broken in. If there is movement or a burglary, the sensors send a push message, a loud siren goes off and the camera starts recording immediately. Unless it’s your pet: the camera ignores animals weighing up to 25 kg. You have two special key fobs that you can use to switch the alarm on and off. And as soon as you get close to your house, the system ‘sees’ that you’re standing in front of the door and is automatically switched off. In addition, the Somfy Home Alarm Pack can be expanded to include additional cameras and sensors. The only plug and play alarm system that chases intruders away before they’ve even entered the premises, including a camera so you can see what is happening inside your home! With this comprehensive Somfy Home Alarm Pack, you can protect every nook and cranny in your house, because the motion detector and the three door and window sensors that come as standard immediately send a push message to your smartphone if there is a burglary. A loud siren goes off at the same time. If unwanted visitors enter your home, the Somfy Indoor camera immediately starts recording. You can then view the clip and download it for free to your smartphone. For your convenience, you get two special key fobs that you can use to switch the alarm on and off. Even better, as soon as you get close to your house, the system ‘sees’ that you’re standing in front of the door and is automatically switched off. Which is really useful if you happen to have your hands full. 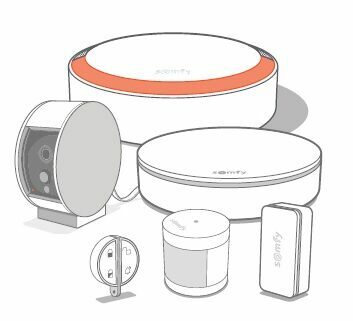 Of course, the Somfy Home Alarm Pack is already a complete system but can be expanded with various accessories, such as cameras and sensors, for instance. The camera starts recording immediately when movement is detected. Full HD video camera: super-sharp images so that nothing escapes you.